Born in 1967 Axel got in contact with electronic music in the age of 12. Fascinated by the sounds of synthesizers and other electronic instruments he discovered a totally new and breath-taking musical universe. He started to search for such kind of music in a local record shop - CDs were not even invented at that time. Later, listening to the radio show “Schwingungen” became a weekly ritual and increased Axel’s interest in various styles of electronic music. While taking Keyboard lessons for almost 6 years the dream of making his own music was growing rapidly and in the age of 16 he bought his first own synthesizer - an ARP 2600, previously owned by Adalbert von Deyen. A few years later he met another guy from Leverkusen who was also working on his first own musical steps - Andreas Morsch. Because of their common passion for sequencer based electronic music they started to work together and founded the band Digital Dream. Within a few years 5 tapes were released before Andreas’ made a break for private reasons. Axel continued making his own music and met Uwe Denzer in 1994 when they became neighbours in the same house. 3 years later, in 1997, Andreas joined the two guys and together they founded Pyramid Peak. 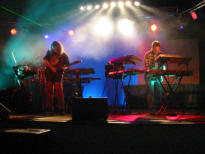 Their first release “Atmosphere” in 1998 was well received and with “Ocean Drive” Pyramid Peak became very popular as the best electronic music newcomer in 1999. In 2002 Axel decided to start his own solo project under the name AXESS and released his first album “First Light” which also found many fans too. “Chamaeleon, his second CD, was released in 2003 and that was also the year in which Axel met Max “maxxess” Schiefele, an extremely talented composer and guitar player from Bavaria. Both started a new musical collaboration and released their first common CD “Contact” in 2004. This CD was a huge success within the electronic music scene and was performed live in Germany, The Netherlands and the UK. Over the years Axel released many more CDs solo, with Pyramid Peak as well as with Maxxess and in 2012 their album “5vor12” won the first price as the best electronic music album in 2011 at the Schallwelle music award.